Dedicated to past, present, and future collectors of pre-prohibition western whiskeyana. Thanks to all for the continuing influx of consignment bottles. We're appreciative of the ongoing support and opportunity to help great bottles find great homes! And don't forget, our fee is still only 10% of the final value and there is no buyers fee! Our email is jsglass@q.com. For Sale - Click on the "for sale" link right below - it will highlight and open another page. In the mid seventies, I saw the writing on the wall and started squirreling away honest paper labeled "stuff". It didn't take a rocket scientist to realize that the glass was going to outlast the paper by a few thousand years. Plenty of time for me to enjoy... Paper labeled whiskies, viewed as cast-offs, were affordable and back then collector competition was next to nothing. So, whenever I had a couple of nickels to rub together, I picked them up. It was about that time that Bob Barnett and I tossed around the relative rarity of embossed vs. labeled. And so, without fail, every few months my old pal would ship me over one or two that had showed up on his doorstep. Six dozen and change later, I've got a fair representation of labeled bottles, most also embossed and a few with contents, competing for space with the "hitters". And truth be known, I value many of the labeled tool tops as much as I do my tooled pictures and "top shelf" globbies. Sure, when the time comes to pass them on to the next generation of collectors, they won't bring anywhere near the dollars that the yellow Tea Kettle, the green SHM, or the chocolate amber globby Bear Grass will, but for uniqueness this labeled stuff can't be beat! And so, the next few postings will delve into the realm of paper labeled tool tops. We'll start off with Del Carlo Wine and Liquor Co.. Bob shipped three different ones to me around 1980. They'd come out of a collection down in the Bay Area. What first caught my interest with Del Carlo's wares was that all were on swirled shoulder slick cylinders. A novel approach to making sure that their product stood out against the other plain, label only, competitors on the shelf. And the graphics were nice; multi color, not overly done, but very eye catching just the same. The first one, Golden Gate Whiskey, is just plain neat. The brand is, oh so, San Francisco. And the use of pastels and gilt really sets it off. Spelled, Whiskey, (KEY instead of KY) it's obvious that the brand was distilled and rectified in San Francisco. The bottle itself is extensively air vented and neatly made. No base marks are present. 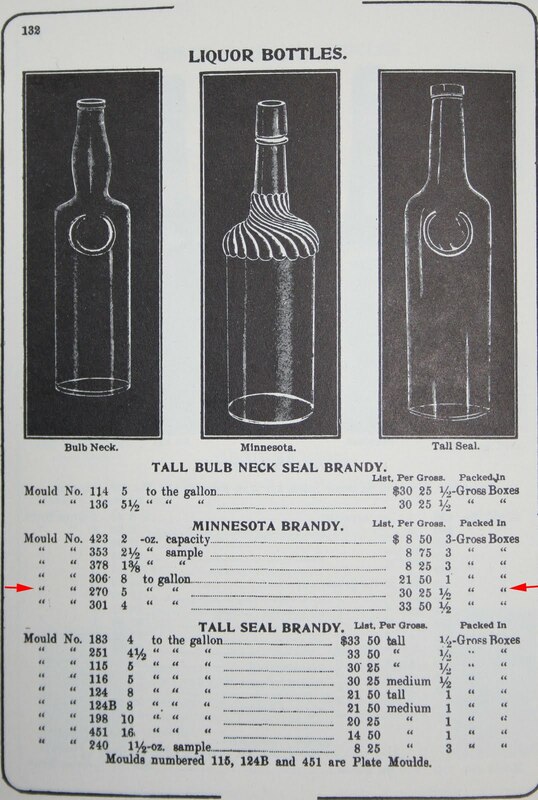 According to glassworks catalogues of the post earthquake era, this style of whiskey bottle was called a Minnosota Brandy. The empty bottles ran the liquor dealer the princely sum of twenty one cents apiece. 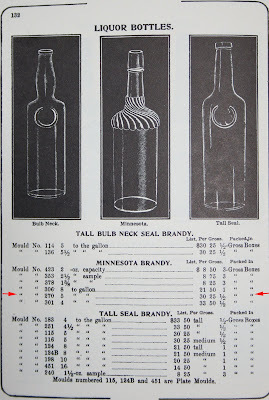 With a little research, I was able to locate the lithographer, Occidental Supply CO., S.F., who produced the labels. They appear in the March 22, 1909 San Francisco Call classifieds; advertising themselves as Wine Makers Suppliers at 525 Market. The last one out of the box came as quite a surprise. A. P. Hotaling & Co. Belmont Whisky. Whisky spelled KY indicated pure Kentucky Bourbon instead of the west coast product spelled KEY. 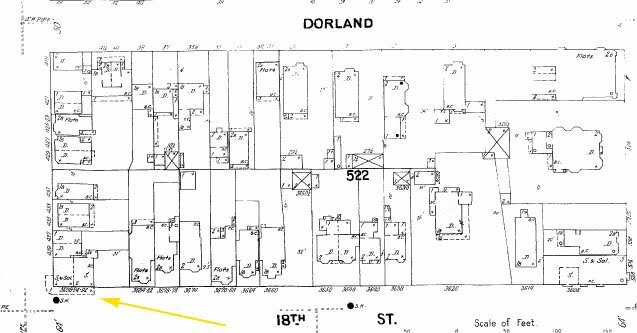 Del Carlos address was again listed as 3692 Eighteenth St. and the phone number was Park 2154. Hmm, that should be enough to start the search. 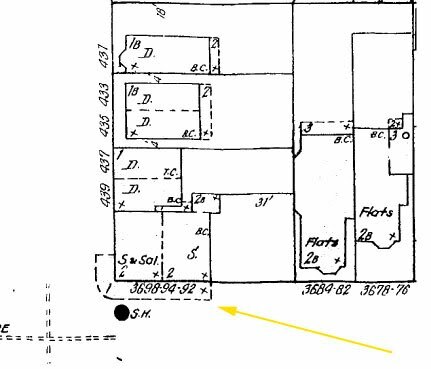 Sure enough, the Sanborn map plainly shows a saloon at that location on the corner of Delores. Several hours of sleuthing for hard data about D. Del Carlo, the principals of the saloon and or company, or the years that it was in business came up absoultely blank. Nuthin'! None of the City directories or phone books dating from 1895 - 1915 make any mention of the business. Still, there it is, plain as day. Dating is also made easier by the Pure Food and Drug Act stamp of 1906 on the label. And that makes sense, since the residential part of the city expanded westward after it was rebuilt, subsequent to the Great Earthquake and Fire. Two theories about the Belmont brand are possible; either Del Carlo purchased unblended Kentucky Whisky in hogsheads from Hotaling and rebottled it under license, or they were nothing but a fly by night backwater saloon bottling red eye with a fancy label. Lending credence to the latter is the fact that the Belmont brand does not appear in the list of brands registered to Hotaling. 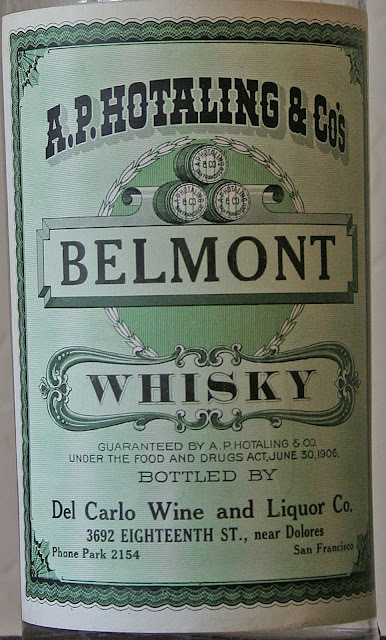 In fact, only two western wholesalers registered the name Belmont; one being James Gibb (Belmont Whiskey) in 1902, the other an outfit by the name of Venaglia, Costa & Co. (Belmont Club Whiskey) that registered it prior to Gibb, in 1899. Shame, shame on Del Carlo; another imposter? Del Carlo was a apparently a legitimate dealer and authorized to sell the A.P.Hotaling Co's brands, including the proprietary Old Kirk Whiskies. I have some labeled fifths and flasks from their establishment, as well as a few unused labels. A "hoard" of them was discovered some years back, but the date eludes me. At 64, "CRS" hits more often than not. Well, that's my excuse and I'm stickin' to it. You would be surprised at the number of brands that the A.P.H Co sold, or was an agent for, during the 1910s. Among others was Old Grand Dad, Old Crow, and Olympic Club. Their "House Brand" remained Old Kirk until prohibition, but they sold the APH brand through and after that unfortunate time. Along with "medicinal liquors", they survived by producing flavored syrups and other products for soda manufacturers and confectioners. PAYING CASH! Wanted - better western cylinders, flasks, and miniatures. One or a collection! Fair prices paid. We also do consignment sales. 50 years of respected western whiskey experience. For those of you who have called me on my home phone in the past, be advised that I've cut the cord. 541-899-8411 is no longer a valid phone number. To touch base, please, drop us a line via email and I'll provide you with my cell number! Pre-Pro Shot Glass List is now available! A large list with 70 shot / dose and Hi-Ball Glasses! Call or Email for a copy. Wanted J.H Cutter C.P. Moorman Manuf'r olive if possible and in mint condition. also looking for JH Cutter A No 1, T40, mint condition. Tea Kettles in light colors mint. And several other Applied top Western fifths and flasks. Feel free to contact me. Want to touch base with me without using the article comments bar ? Have an article that you'd like me to post? Care to share photos? Barkeep... this whisky's for the birds!